John Halliday has gained cross-party support for his plan to create a civic square above the city's railway station. Political parties have backed plans by a leading architect to replace the controversially abandoned City Garden Project. John Halliday, of Halliday Fraser Munro architects, has proposed building a civic square above the city’s railway station, with the main entrance moved to Union Street. 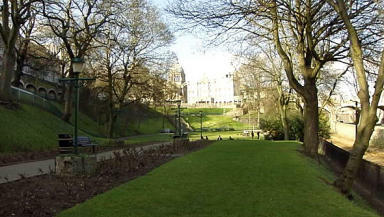 Much of the Victorian gardens would be retained, but the Denburn dual carriageway and railway line would be covered over. The plan has won the approval of the council’s two largest political parties, but it is not known if businessman Sir Ian Wood is prepared to back the project. Sir Ian’s £50m funding pledge was instrumental to the original plans to reshape Union Terrace Gardens, which were scrapped when Labour took control of the council last year. The previous SNP-led administration had held a referendum which came out in support of the £140m project. Deputy council leader Marie Boulton described Mr Halliday’s scheme as a “transformational project”. SNP group leader Callum McCaig said: “We were obviously in favour of the City Garden Project. We felt that that would have delivered the transformational change and obviously had the mandate from the people.